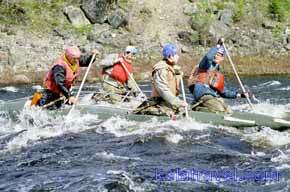 Raft 5 days full of action on the longest wild water track of the Kola Peninsula. 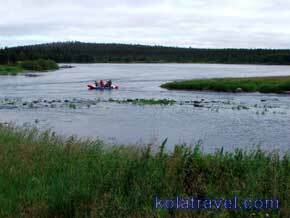 The Kola Peninsula has more than 100.000 rivers and lakes with many islands. 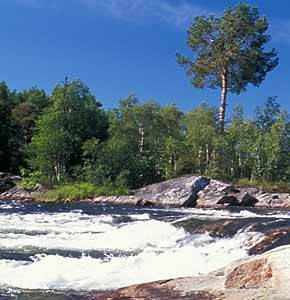 The Umba River flows from the centre of the Kola Peninsula 150 km downstream to the White Sea and has many white water parts. Rafting enthusiasts know that and that makes the Umba River well know. Here in the North we use catamarans instead of rafts. Catamarans have two rubber floaters connected by a trampoline, are smaller then usual rafts, are very safe, carry 2 or 4 participants depending of the model and carry the luggage on the trampoline. These 5 days you will in the huge wilderness of the Kola Peninsula. You will not be hungry, beside the food on board your guide will enrich your meals from the "fruits of nature", mushrooms, berries and tjakka (coffee made of the northern birch). Learn how important fire is to survive and overall how safety is in the nature. During your tour you will visit the most interesting places on the Kola Peninsula, We will spend time for watching a famous artefact on the Kola Peninsula: the ancient rock carvings; "Petroglyphs of Kanozero" dated 5000 years before our era. Day 1: Arrival at Murmansk airport and transfer to lumberjack guesthouse "Yolki_Palki". Check-in at a guesthouse. Dinner and overnight. Day 2: After breakfast transfer to the end of Umbrozero Lake where the Umba River starts to flow southwards. This is the beginning of your rafting tour on a catamarans. After the start excitement starts immediately with big waves and you get acquainted with the catamaran. Lunch during the day and dinner on the shore of the river. Overnight in tents. Catamaran daily distance: 15 km. Day 3 to 5: Every day after a good breakfast we paddle about 15 km with a snack stop on the water, a lunch break (with campfire) on one the many beautiful shores of the river and at the end of the paddling day we make a camp with campfire and have a good dinner. Halfway we reach Kanozero Lake. We will spend time watching a famous ancient rock carvings; Petroglyphs. These mystic artefacts are dated 5000 years before our era. There is still considerable conjecture as to what purpose the carvings actually served, but most scientists agree that they played a part in the rituals of very early inhabitants of the area. They are related to number of the most famous ancient arts in the world. Overnight in tents. Catamaran daily distance: 15 km. Day 7: After breakfast transfer to Murmansk airport for departure. Optional: Transfer to Kuusamo or Rovaniemi airport in Finland. 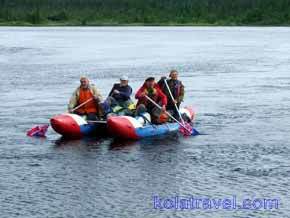 Expand your holiday with other active tours or city trips on the Kola Peninsula with Kola Travel. The participant must have experience in paddling on a streamline and must have a good condition. 07.06 - 21.06. ; 05.07 - 19.07. ; 02.08 - 16.08. ; Other dates auf request >> Click here!